Few things are more romantic than jetting off on an exotic vacation with your love, but a full-on adventure may be more than you’ve got time (or budget) for at the moment. That’s precisely why they invented the staycation. Book a night or two at these lodgings that are all within a quick drive and get all the lovey-dovey experience without the jet lag. Sure, Valentine’s Day falls on a Thursday this year, but we’ll let you figure out the logistics of that yourself. 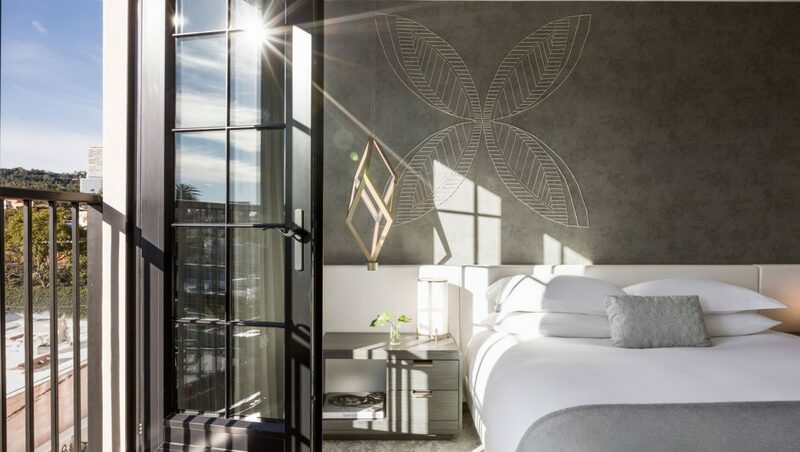 There are hints of dreamy Mediterranean style in all the details of this new WeHo outpost from the Kimpton group. If it’s warm, you’ll be soaking up a little sun poolside, but if it’s chilly, the shelter of the courtyard bar works too. You don’t even have to leave the property, as the on-site restaurant, Viale dei Romani, has been getting positive buzz for Chef Casey Lane’s modern trattoria cooking, and pups are welcome, too. Do you like your romantic Old World-inspired getaways with a few… ghosts? Well, that’s kind of weird, but if so, you’re going to want to check into Mission Inn. Considered among the most haunted hotels in California, the sprawling property, first opened in 1876, holds a special distinction from the National Trust for Historic Preservation. The on-site Kelly’s Spa is a favorite for luxe treatments. The swanky new NoMad has just opened its DTLA doors, and with everything done up in vintage gilding and plush velvet, it’s a real looker. Plan a chic date night that starts with cocktails at the dimly lit Giannini Bar, and includes a soak in your room’s luxurious, oversized bathtub. Whisk your partner off for a relaxing seaside vacay without setting foot at LAX. The hotel was totally remodeled last year, after the same group that owns SoHo House bought the place off David Geffen for a cool $80 million. It’s the rare Malibu spot offering lounge chairs right on the sand, directly out the hotel’s back door. After a day at the beach, enjoy a sunset dinner on the restaurant’s glass-enclosed patio that appears to hover over the waves. The SLS is offering V-Day package they’ve dubbed Sweet Loving Stay catering to romance-seekers. Book the deal to upgrade your overnight stay with breakfast in bed, a bottle of Veuve Clicquot, chocolate-covered strawberries, rose petal bed turndown service, and more, as well as access to a dedicated “romance butler” who can help you put together any other date-night experiences you may fancy. Slightly farther afield, but still less than two hours away, Big Bear is a perfect destination for a snowy mountain getaway–and this 1950’s lodge-turned-chic modern retreat is a the ideal base camp. Many of the cabins have fireplaces for maximum cozy vibes. Next articleWill the Industry Continue to Embrace Director Bryan Singer?